Enhance the appearance of your kitchen with my painting services. As a dedicated and experienced painter, I go above and beyond to ensure all your requests are catered for when carrying out work on your kitchen. For further information about the bespoke and pine kitchen painting services I provide, please get in touch with me in Newhaven, East Sussex. You may not be aware, but most kitchens can be hand-painted. 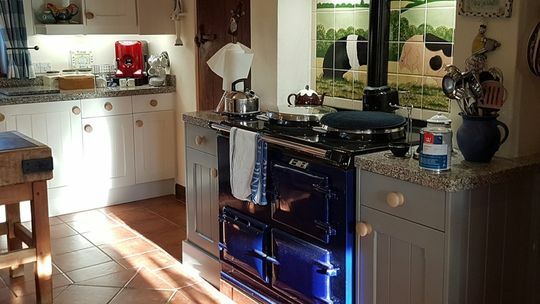 As a specialist in upgrading 10- to 20-year-old bespoke oak or pine kitchens, I utilise my many years of experience to ensure that your kitchen is both visually appealing and practical once painted. Dark oak, orange pine, MDF, maple, clear lacquered, varnished, waxed, even laminate kitchens and furniture can all be transformed with a hand-painted finish. Repainting your kitchen is an advantageous way to freshen its appearance without the unnecessary expense of changing the layout of it. In this service, I clean down your wooden kitchen, prepare and prime it, and hand paint it in a colour that complements its appearance. Please be assured, I give you an array of paint colours to choose from, so you can be confident that your kitchen will look exactly how you envisioned it once completed. If you have an old, traditional kitchen, then this service is ideal for you as these types of kitchens are usually built to last. For your peace of mind, a thorough check is still carried out before work commences to ensure your kitchen’s doors and drawers open correctly. If any adaptions need to be made such as new handles, tweaks to hinges, or drawer runner replacements, I can also do this as part of the service. Furthermore, if you decide to upgrade your kitchen, I can refer a reputable craftsman who can recommend and install replacement worktops or new tiles as well as modifying cabinets if this is deemed necessary. Whatever your kitchen painting requirements, you can depend on me to meet them. I am a trusted painter with an enviable reputation throughout the Sussex area, and therefore, you can be confident that all projects will be completed to the highest standard. When properly maintained, a designer-painted kitchen will last for many years to come. As a proficient painter, I have the skills and experience needed to repaint stunning kitchens and furniture. Although I predominantly focus on painting kitchens or utility rooms, I carry out painting work on furniture pieces, studies, libraries, and free-standing wardrobes as requested by customers. 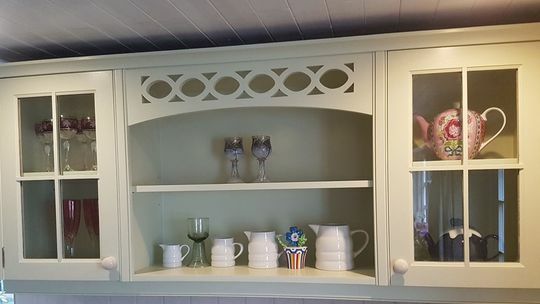 I hand-paint custom-made wooden kitchens using the finest paint, and I can also repaint bespoke hand-painted kitchens. Furthermore, as part of the upgrade service I provide, I can add new handles and worktops, change your floor tiles, and fine-tune your current kitchen layout. Upgrading your existing kitchen is an advantageous way to uplift its appearance without the cost and hassle of starting from scratch. Throughout my 29 years in business, I have painted a variety of kitchens including reclaimed, luxury bespoke, solid mid-ranges, and many more types! You can add a touch of opulence to your home when you buy a pre-loved wooden kitchen and hand-paint it. Plus, this saves you time, hassle and most importantly, thousands of pounds! How Do You Paint a Kitchen? To ensure the kitchen looks exactly how you envisioned it once completed, it is important to use abrasives and specialist primers as this makes sure that the bare timber or MDF, clear lacquered oak, lacquered pine, waxed pine, foil-wrapped laminate, or melamine surfaces are prepared. After everything has been properly primed, the finishing coat can be carried out on the doors and frames. Then once this has been completed, you will be left with a visually appealing and long-lasting hand-painted eggshell or satin matt finish. Contact me in Newhaven, East Sussex, to enquire about the painting services I provide for bespoke, pine, and wooden kitchens.